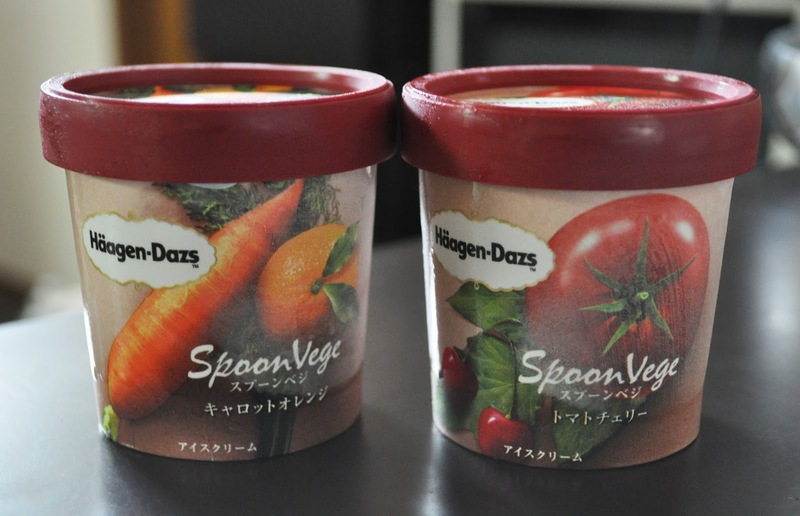 Yup, that's right, Haagen-Dazs Japan has released two vegetable flavored ice creams: Carrot Orange and Tomato Cherry (and yes, tomatoes are fruit). 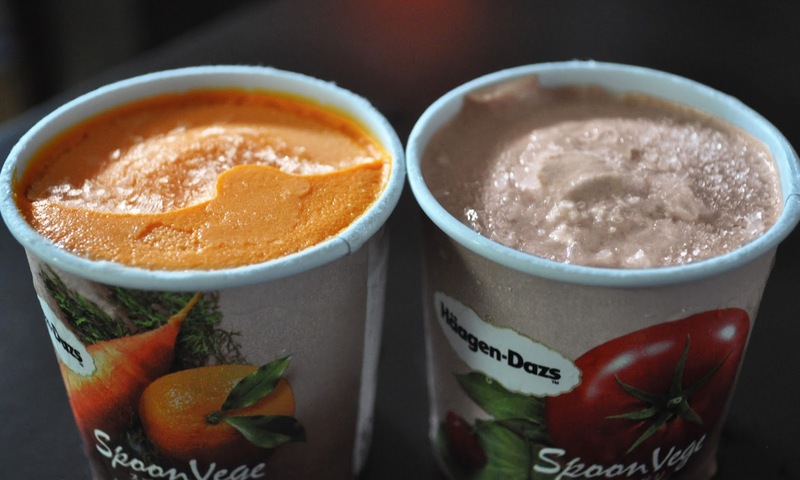 I love Haagen-dazs's seasonal Pumpkin Ice cream, and wanted to give these flavors a try. Carrot Orange and Tomato Cherry are an abomination of all things tasty. I love trying new things, but my curious taste buds couldn't handle the vile assault of these pungent ice creams. Carrot Orange tastes like a soured orange creamsicle that has been sitting in the fridge for 30 years. I couldn't even finish one spoonful of the Carrot orange...just putrid! Tomato Cherry was the most edible of the two, tasting like a mix of strawberry jam with cream cheese on toast. However, after a few moments, it had this disgusting artifical tomato cherry (and who knows what else) aftertaste. I had to stop eating Tomato cherry after feeling nauseated from a few tastes. What veggie flavored ice cream would you like to try? That doesn't sound too appetizing at all. If I really have to pick a flavor, would pick sweet potato. At least it is semi sweet and fit the profile of ice cream. :( This is just an abomination onto the name of ice cream. Gurl, this is the Antichrist of ice cream...gag! Hahhaa...sounds yucky! If they were going to make ice cream the flavors for vegetable would be so easy to spot if it was so artificial! Thanks for sharing! Really??? My husband and I loved the tomato one!!! Oh my goodness. Haha. Interesting idea but those combos don't really sound appealing. And they weren't Rachel. Whomever gave these flavors the green light really needs to have their taste buds checked out! But really, pumpkin sounds divine - the others are... I'm not quite sure. I do like tomato juice... I guess? I remember eating a veggie ice cream in Aomori... Was it spinach? It tasted pretty okay, surprisingly, but I prefer fruity or chocolatey flavours. Spinach sounds interesting. Do you know where in Aomori? Are you still in Japan.